There are so many different activities to enjoy at the beach. 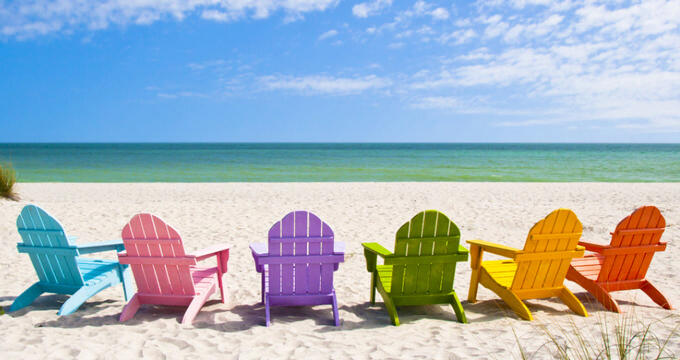 Many people visit coastal areas to take a break from their lives, relaxing in the sand with a good book or enjoying a picnic with family or friends. Others prefer to stay active at the beach, diving out into the water for a swim or bringing along their surfboard to take on the waves. Another excellent beach activity is shelling. For shelling enthusiasts, there’s nothing quite as special as walking up and down the beach, feeling the softness of the sand beneath your feet and looking out for little natural treasures to add to your collection. But you have to pick the right beaches to enjoy the best shelling, and some of the very best can be found in Florida. If you've ever had any kind of interest in shelling, you'll probably have heard of Florida’s Sanibel Island or its neighbor, Captiva Island. Sanibel Island beaches are known all over the world for offering some of the very best shelling opportunities, with reams of shiny, shimmering shells of all different kinds washing up on the shores in remarkably good condition. This makes Sanibel Island beaches some of the best places in all of North America to look for shells to take home with you, but fishing, sunbathing, wildlife watching, and other activities can also be enjoyed on these barrier island beaches. Sanibel Island beaches are must-visit locations for anyone planning a trip to the Sunshine State, especially if you happen to be interested in shelling and would like to grab a few Floridian shells to take home with you. These beaches offer welcoming warm waters and soft sands, with an endless supply of shells to be examined and collected. Sanibel Island itself is often ranked as one of the top places to visit in all of Florida, so it's certainly worth stopping off here. Read on to learn more important information about the beaches on Sanibel Island. This is the main beach on Sanibel Island to do shelling. It's not uncommon to spot individuals or little groups of people combing the sands in search of their next great find, and there are lots of pretty little shells just waiting to be discovered, with new ones being washed up each day. As you might expect, the currents here are quite choppy, so it's not the best place for swimming, but sunbathing and fishing can be enjoyed on Blind Pass Beach. Right by the Blind Pass Bridge, Turner Beach stretches out to cover parts of both Sanibel Island and Captiva Island and is another one of the two main shelling beaches at this Florida barrier island. Swimming isn't encouraged here due to the strong currents, but shelling is very popular and there are lots of shiny treasures to be uncovered. Restrooms and showers can be found over on the Captiva Island part of the beach. Over on Sanibel Island itself, this beach is named after the lighthouse that has been standing on the site for many years and is still functional to this day. This beach is found on the eastern part of the island and is the first beach you come to after crossing over the causeway. There's a large fishing pier here for people to walk out and admire the waves or try to reel in a big one, and some lovely soft sands can be found here too. A nearby nature trail offers another option for beach-goers to spend some time, and the local amenities include restrooms and outdoor showers. Featuring a large parking area, along with restrooms and public showers, Tarpon Beach is another picturesque Sanibel Island spot to spend a day. It's found at the southern end of Tarpon Bay Road, around halfway across the island itself. It's a simple beach that stretches out a good distance in both directions, offering a lot of space for everyone to enjoy. One thing to note about this Sanibel Island beach is that it doesn't offer much shade, so an umbrella is a good thing to bring along. With sugary white sands and a gentle salty smell in the air, Captiva Beach is over on Captiva Island and is another of the best beaches in the Sanibel Island area. There aren't many parking spaces here, but it rarely gets overly busy, so it's never too difficult to find a spot. The beach is soft and welcoming, with gentle waves lapping up onto the shore. It's a nice place to simply sunbathe and relax, and it's also an excellent spot to watch the sunset. The Causeway Beaches can be found on the slim sliver of land leading out from the Fort Myers area over to Sanibel Island itself. Small beaches can be found along both sides of the road, allowing drivers to simply pull over at almost any point and step out onto the soft sands. There are no fees at these beaches and the local amenities include restrooms and picnic tables. Swimming, windsurfing, kayaking, and fishing are very popular at these beaches, along with simply sitting down and admiring the view of nearby Sanibel Island and beyond. A beautiful beach with stunning white sands, Gulfside City Park offers both grassy and sandy areas for visitors to spend some time and listen to the waves. This beach, despite being located on a highly popular touristic island, never gets too crowded, so it's a nice spot to visit if you're looking for a little peace and quiet. Restrooms and showers can be found here, and there are also picnic areas and even grills open for public use, so it's a super spot to visit on a sunny weekend or special occasion.